Duluth's public golf courses are deeply in debt and in need of an upgrade. 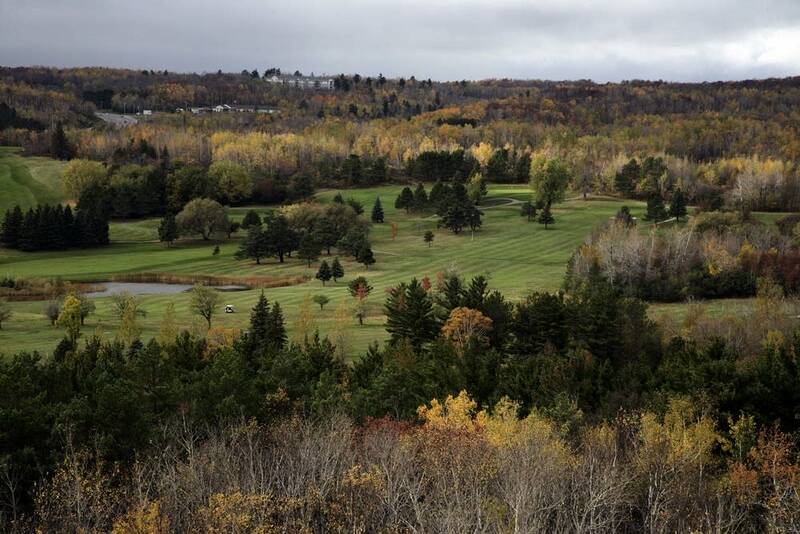 But with little hope that shrinking patronage trends will reverse, city officials are exploring the possibility of selling some or all of Duluth's two public courses: Enger Park, perched on the hillside above the city; and Lester Park, which sprawls on the far eastern edge of town and offers commanding views of Lake Superior. Over the past year city officials, golfers and others formed an advisory committee to study how to make golf sustainable in Duluth; they released their findings last week to the city council. But as the city grapples with the tough financial realities of operating public golf courses, residents are also voicing concerns about the possibility of losing treasured publicly owned green space. "We're custodians, we're... retirees, we're teachers, we're folks that make up our community and enjoy being out on our public parks," said Chris Stevens, president of Friends of Duluth Public Golf. "These are regular Duluthians who for whom golfing is soul food," added Jim Filby Williams, Duluth's director of public administration. "It's friends and natural beauty and exercise. That's what parks and recreation programs are all about." Over the past several years, golfers have played around 70,000 rounds a year on Duluth's two public courses. Last year, that number dipped below 60,000. And while that's still a lot of golf, it's not nearly as many rounds as golfers here used to log: In 2000, they played 100,000 rounds. Those trends mirror what has happened nationally. In the past 15 years or so, golfing participation has taken a nosedive, dropping from around 30 million golfers in the U.S. to 24 million. "The number of golfers has gone down significantly and the number of courses has gone way up," Filby Williams explained. "So we're spreading a smaller number of golfers across a larger number of courses. And many courses are closing." In Minnesota, about 40 courses have closed since 2005. Many of those shuttered courses were sold to developers and eventually turned into housing. Warren Ryan, spokesperson for the Minnesota Golf Association, said the closures are a correction to the overbuilding of courses that began in the 1980s. But in addition to fewer golfers, Duluth's courses also face other financial challenges: They've recently lost around $100,000 annually, and have amassed a debt of $2.4 million. Duluth's municipal courses are not alone in losing money in Minnesota. The state auditor's office tracked 34 city-owned courses in Minnesota in 2017. 30 cities lost money on golf courses that year. And several lost a lot more than Duluth. But Enger Park and Lester Park also need a lot of work. The report the city's golf course advisory committee presented to the city council found that at least $7 million in capital improvements are needed. "It's a lot of money," said city council member Gary Anderson, who represents the district where Lester Park golf course is located. "And how do we do that when we have limited funds, limited willingness for taxpayers to pay for parks in general, or maintenance work?" Anderson, Stevens and Filby Williams all served on the advisory committee. And while they didn't offer any specific recommendations to the city council, the committee did find that Duluth will likely need to close some of its 54 golf holes, and to sell some land to pay for necessary upgrades. That could mean selling part of one or both courses. Or selling an entire course. The most likely prospect for some sort of sale is the Lester Park course, which is also frequented by cross-country skiers and dog walkers during the off-season. "I'm here simply to remind my city councilors and especially the mayor and her administration that they do not own Lester Park Golf Course, and therefore it's not theirs to sell to a private developer," said Ryan Jones-Casey. "Once this tract of public green space is gone, it's gone for good," said Rich Staffon, president of the local chapter of the Izaak Walton League, a conservation group. "This is the people's land, you are the trustees of that land, and we are looking to you to treat that land with care, and really think hard about how it should be used." "Remember the parks are for all of us, and it's a slippery slope when we start to give away our developed parkland for anything other than the pleasure of the people," said Tony Dierckins. Duluth officials have granted a developer the exclusive right to negotiate with the city until the end of 2019 on the potential sale of Lester Park. That developer, Duluth native and Florida resident Tom Sunnarborg, has suggested turning part of the land into housing, while continuing to operate none or 18 holes as a privately owned golf course that would be open to the public. The city stresses it has not committed to actually selling any land yet. And any sale of public park land would require a supermajority vote of the city council — eight out of nine votes. Anderson said preserving green space is a critical issue for him and his constituents — but so is housing. "Where else do we have 75 acres of open land in the city of Duluth that is actually fairly close to a road, fairly close to public utilities? We don't have open space. So that's a huge issue," he said. Meanwhile, golfers argue the city hasn't done enough to promote its golf courses. They say the city needs to do a better job marketing the courses, and could do more to diversify what they offer. Friends of Duluth Public Golf could also leverage their nonprofit status to seek outside funding, they say. Stevens, the group's president, said his members want to find a way to keep both courses open. For him, it's about keeping alive a tradition. He learned the sport from his father, playing on public courses. "I have young children now, and I want to be able pass along that legacy, and I want them to play public golf because that's where the real people are," he said. Over the next few weeks, golfers and the city administration will develop recommendations on how to move forward. They plan to present those plans to the city council in April or May.